public comment? seeing none. 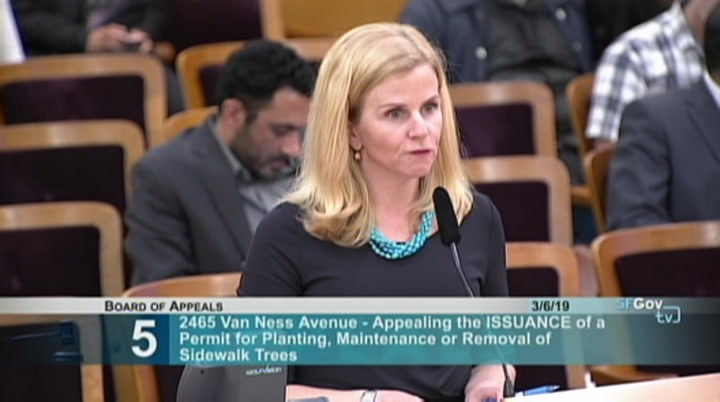 we'll move on to item 2. commissioner comments and questions. >> president fung: no. 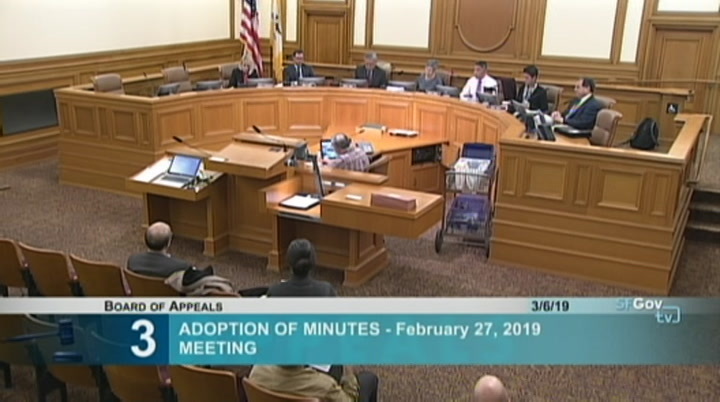 >> we'll move on to item 3, the adoption of minutes. minute of the february 27, 2019 board meeting. 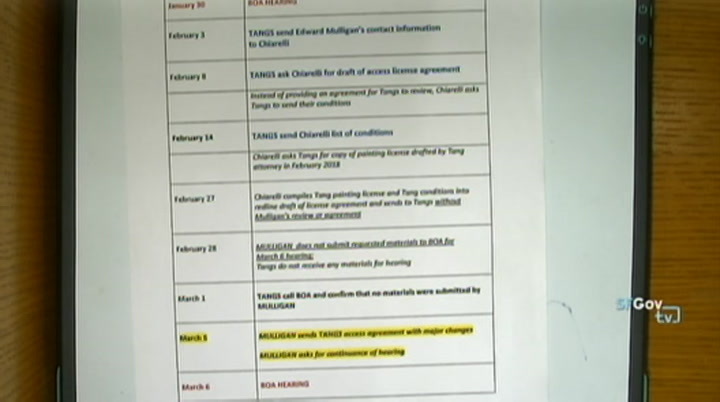 >> president fung: any corrections or additions? >> no. 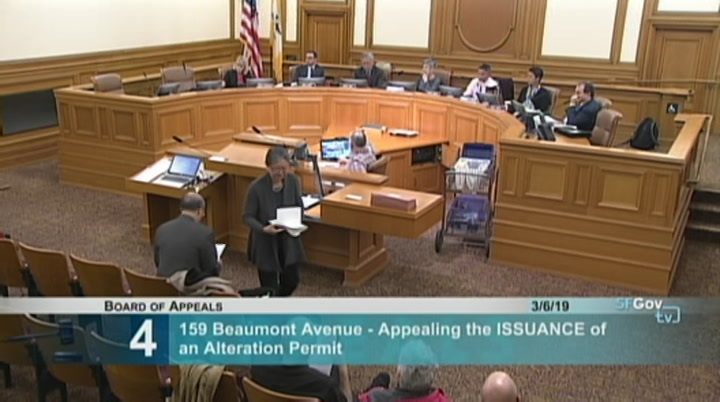 >> president fung: motion to accept. 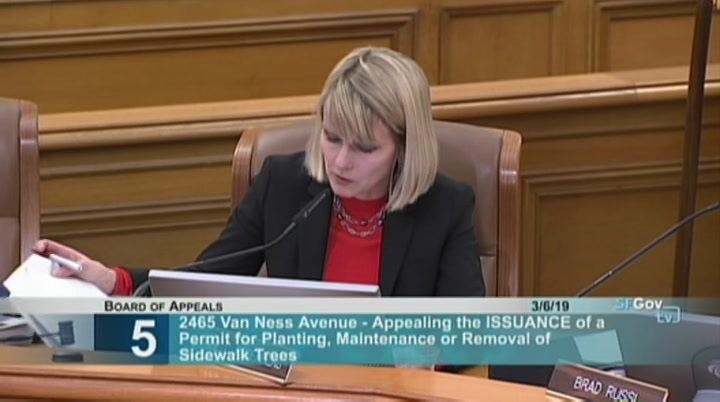 >> we have a motion from commissioner lazarus to adopt these minutes. is there any public comment on this motion? seeing none. [roll call] the minutes are adopted. 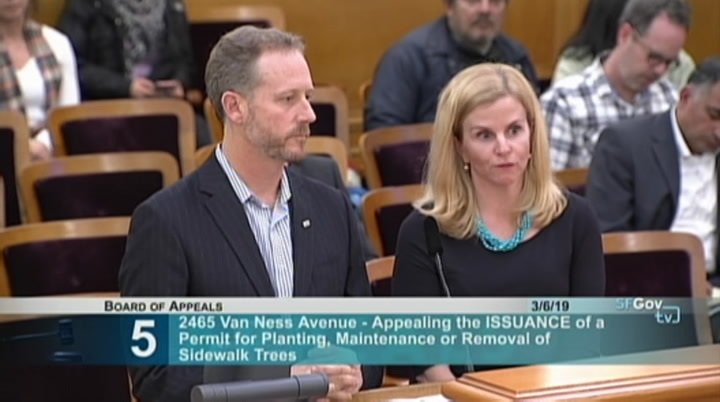 we'll now move on to item 4. this is appeal number 18-116 pamela and eric tang. contractor to take the place of mr. mulligan. unfortunately, mr. hendrickson is at open heart surgery for his son and will not be able. certain other issues need to be addressed. we wished to work with mr. duffy's office to get this finalized. but prohibited because mr. mulligan's unavailability and mr. hu hutchinson new availability. the request was made. >> thank you. mr. and mrs. tang. you have three minutes to sponsored to this request. 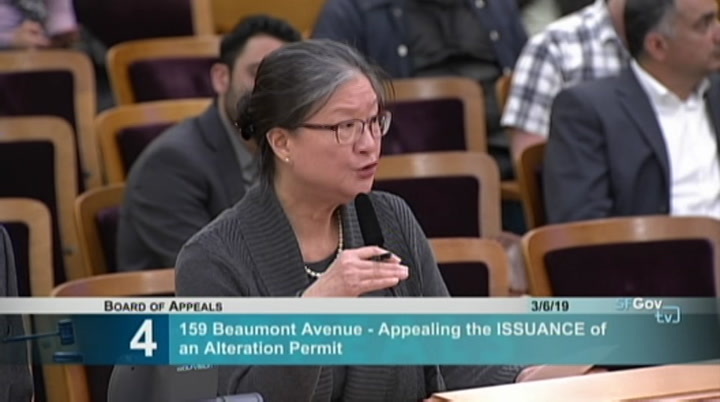 >> pamela tang appellant. flight access -- applicant to access our property. 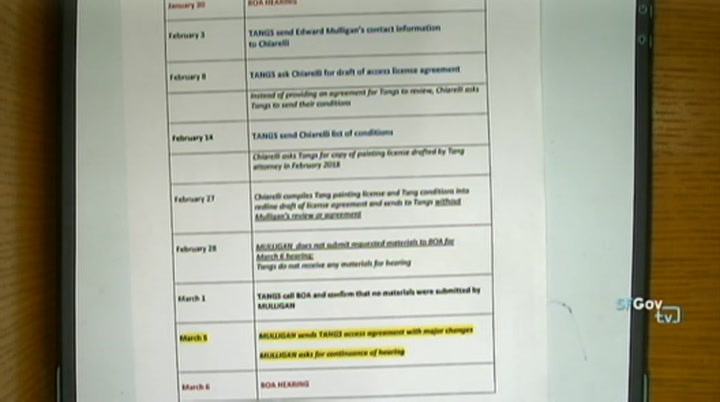 this log shows our good faith effort to initiate and negotiate the access agreement these past five weeks. it also shows that the permit applicant is refusing to work with the time line set by the board. we did not receive any actionable material until yesterday afternoon. the permit applicant would not review it until the day before the hearing. even though, they were well aware that last thursday was the submittable date to the told -- today's hearing. since the board confirmed it was clear code violations. respectfullyask board of appeals to issue the order. the amount of time originally prescribed by the board. accidents happen. 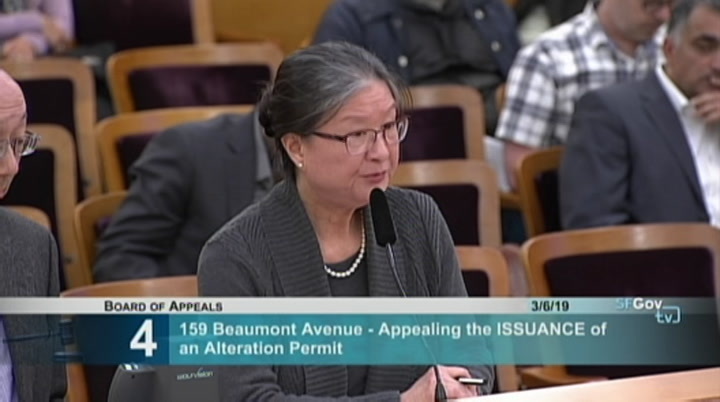 the gas line explosion at parker and gary last month highlighted the importance -- >> ms. tang. 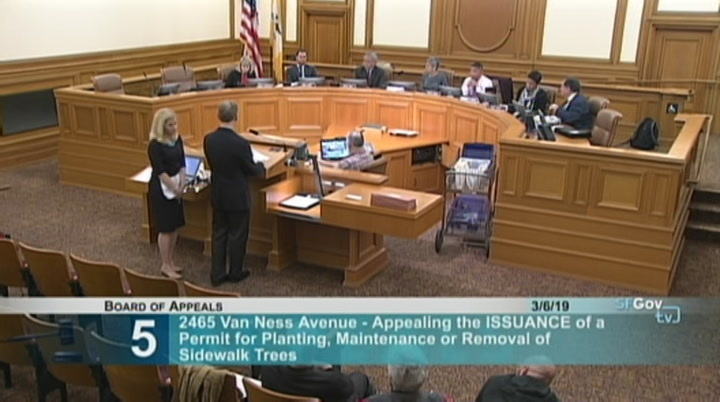 we're only dealing with the continuance at this point before we hear the actual -- before the decision is made. >> you still have 30 seconds if you want to add anything. >> on the continuance. >> thank you very much. >> thank you. mr. duffy, do you have anything to add? >> good evening commissioners. joe duffy. 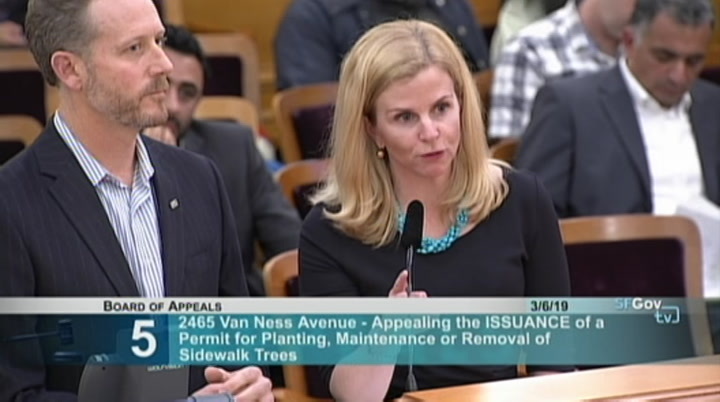 since the last hearing, i have been contacted a few times by different parties on the permit holder. 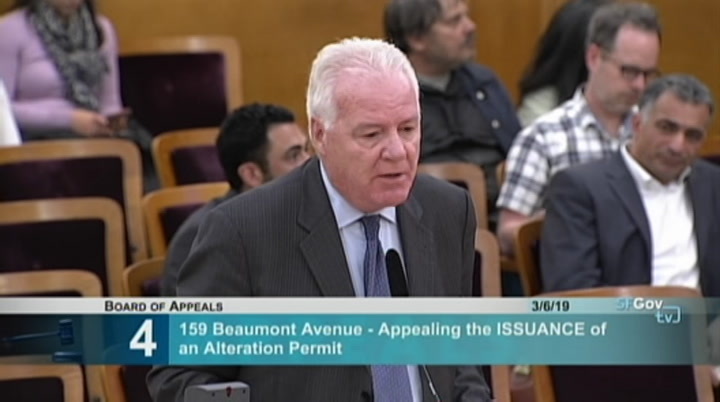 mr. mulligan did contact me that he wasn't going to be dealing with the permit issues. he had some health issues. he came to see me. that was fine. i got a call from the new contractor, his name is mr. hutchison. he was worried medical issues with his son. i advised him to contact the board and ask for a continuance. i also spoke to the attorney here and mrs. mulligan called me as well. i've been in touch with him about it. more time in my opinion is fine. these windows were in for 28 years. this permit d.b.i. got drawn attention to it. we issued a notice of violation for the expired permit. we are on notice. everyone knows that the windows needs to be filled. finding a an architect what they need to do. 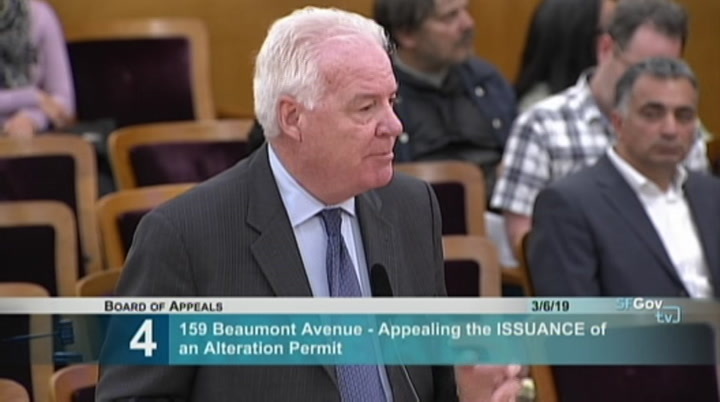 if you want to harry this case tonight, uphold the permit and do it on revision permit. it's entirely up to the board. the special conditions permit obviously, would not be appealable. there's no doubt about it that the opening have to be -- they are gone. everybody acknowledges that. it's a matter of finding someone to do the drawings. i did speak to the attorney yesterday. >> mr. duffy. minutes. you have three minutes. >> we admit that these windows do need to be removed. unfortunately, the information provided to get the original permit was inaccurate. there's a second issue that needs to be raised. there are certain openings that are parallel to a stairwell that takes up to the front door. initially, that was there since the house was built. there were great to protect anyone from falling out, falling out the stairwell. wall within 3 feet of the prompt line was what he was talking about. should never have been allowed. we understand that these additional openings are outside the scope of today's board hearing. 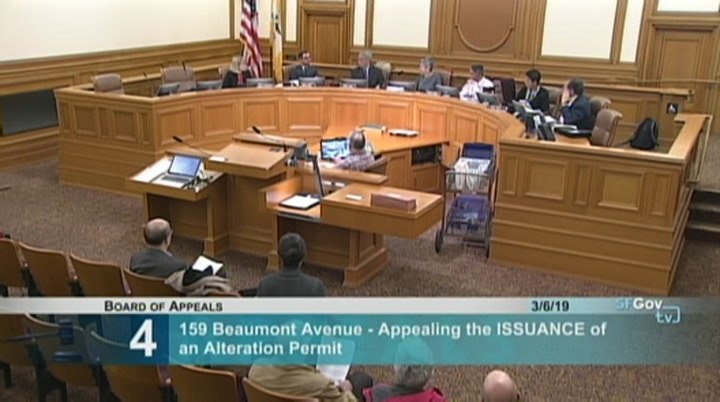 our focus tonight is really on enforcing the closure of the two 1990 lot line windows under that permit. >> thank you, mr. duffy. >> joe duffy. 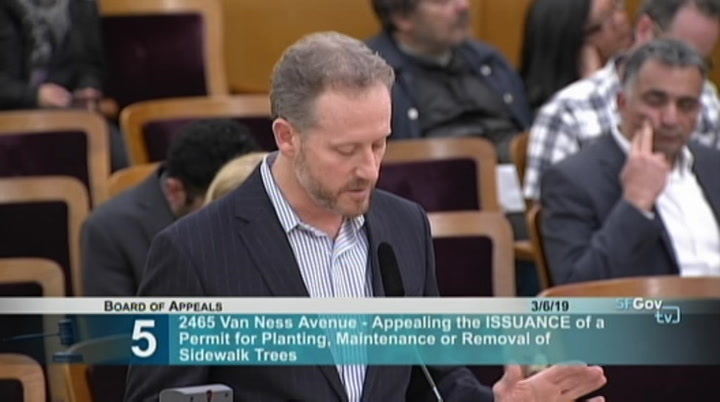 as you said earlier, i would encourage the permit to be upheld. it was frustrating since the last hearing to not only receive a second complaint on the d.b.i. property line windows that were put in the 80, 90 or 100 years ago. i'm available for any questions. thank you. >> any public comment on this item? 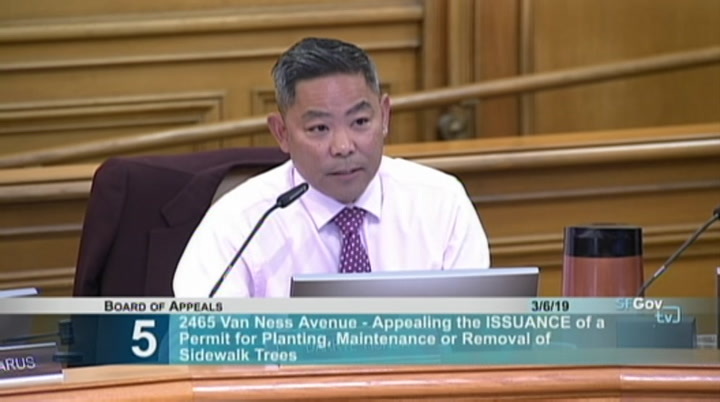 commissioners, this matter >> president fung: commissioners , i would lean toward the following -- intent is build path of a revision permit. 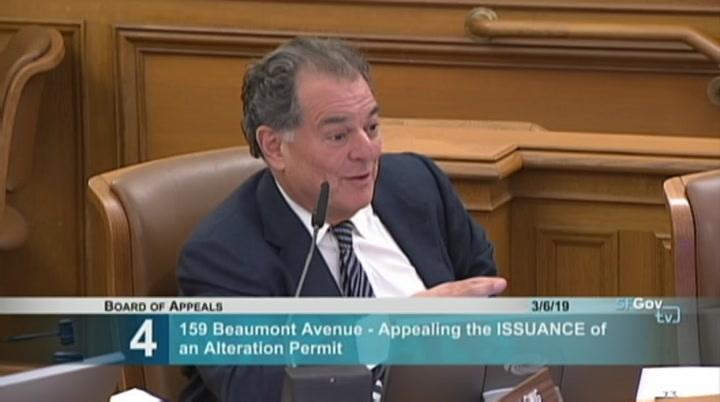 the path that i would recommend that we go is to grant the appeal and condition the permit. , showing the removal and infill of the two windows. avenue. 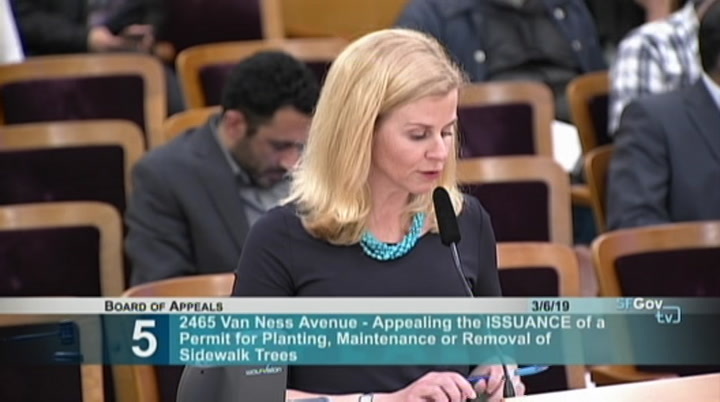 permit for planting maintenance removal of sidewalk trees to remove two sycamore london plain trees that are minimum of 36-inch box size on the sidewalk adjacent to the subject property. 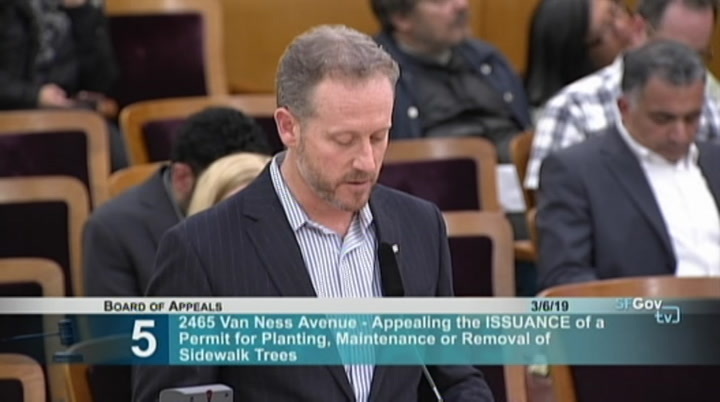 this is permit number 781669. on january 30, 2019 the board voted 4-1, vice president swig absent to continue appeal to march 6th. vice president swig, did you have the opportunity to review the video and materials for the hearing which took place on january 30th? >> vice president swig: i did. >> we are basically starting this appeal a news you may recall. 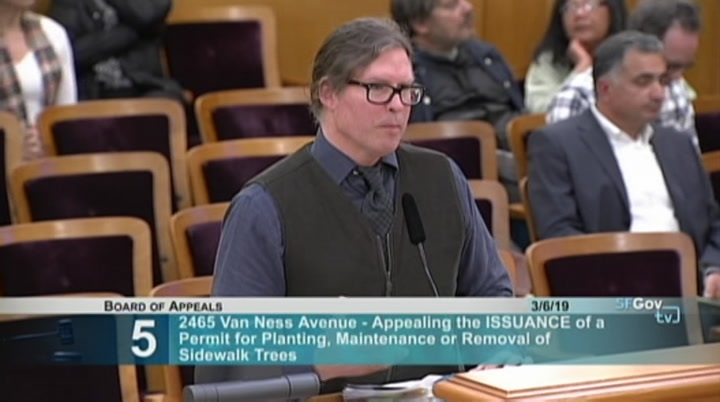 there was an issue with the permit holders. we'll hear from the ep -- appelt first. mr. klipp you have assessmen --. place. 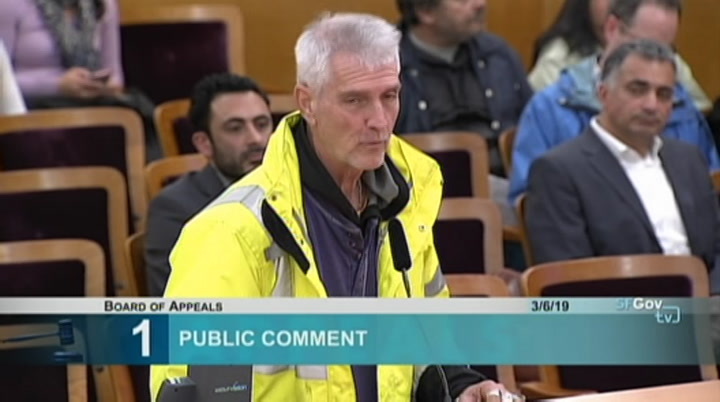 why the prefab panel argument came up in hearing without questions. 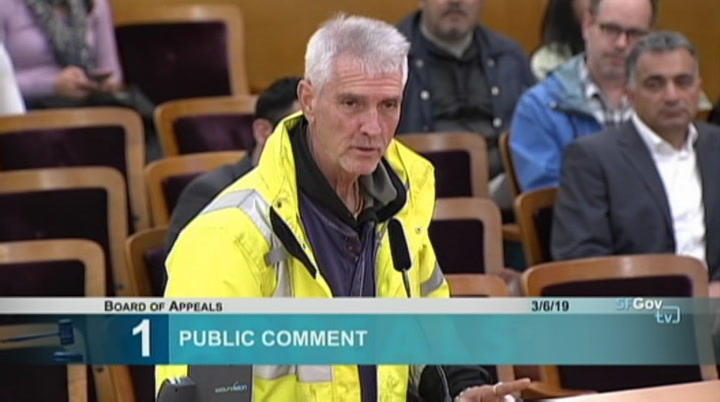 why that hearing was allowed when there's no record of appeal from the permit holder. 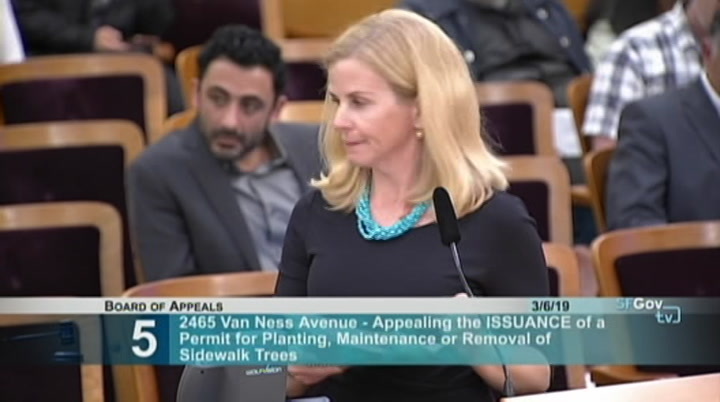 even after the permit was suspended, project violated the board's order, why public works did nothing but issue a fine for a project this size doesn't even amount to a slap on the wrist. 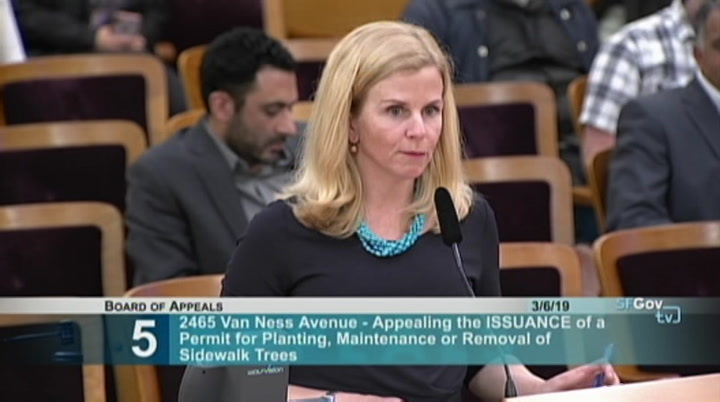 there has been pursuant of no other remedies including remedies that are mandatory under article 16. in 2014, the public works rolled out urban force plan that promised 50,000 more trees. 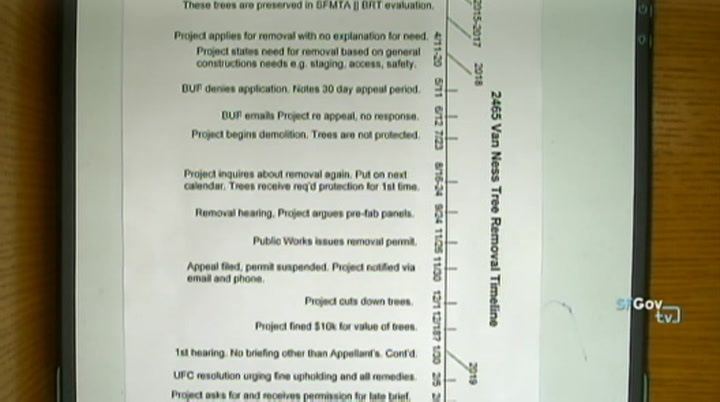 which amounts to 2500 trees a year. we have never met that goal. [please stand by]. bau s.
preserved, everyone believed that they could be but as the ultimate designs, plans and construction management plan were developed, it became clear that preserving the trees created a previously unforeseen safety hazard. 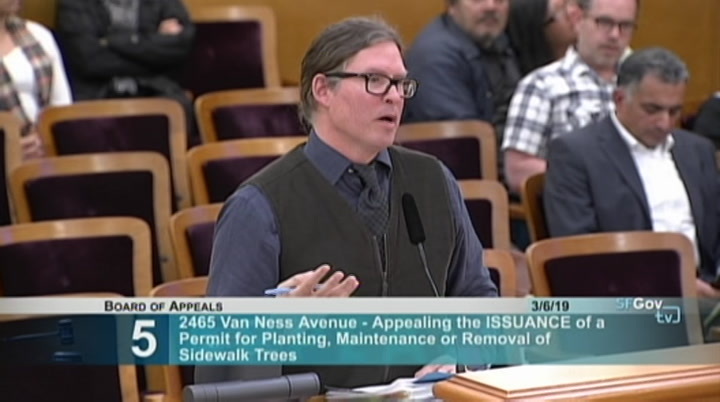 unfortunately, sometimes this happens and it is always hard, but when it does, it does not mean that there was an an intent to remove the -- always an intent to remove the trees. 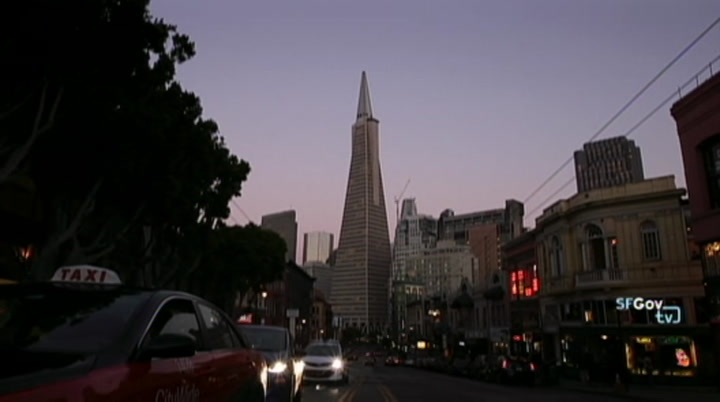 there was a lot of discuss about the decision to use precast concrete panels on the project. these precast concrete panels reflect a certain desired dine aesthetic in a construction technique that makes projects like these feasible. 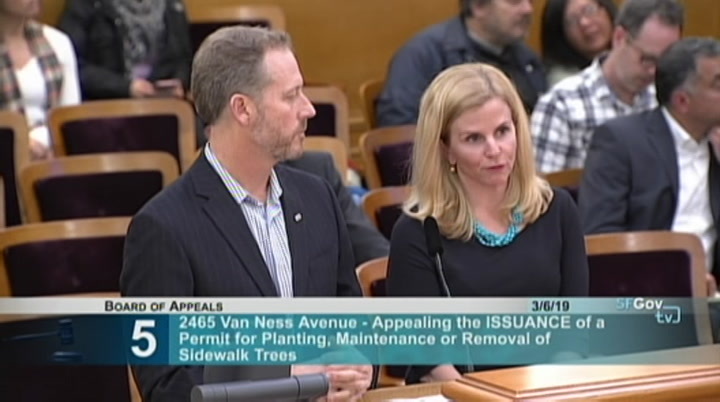 webcor is the general contractor, and within its role, webcor determined that retaining the trees on vanness during the construction of the project and the installation of panels created a safety hazard to its workers and the public. 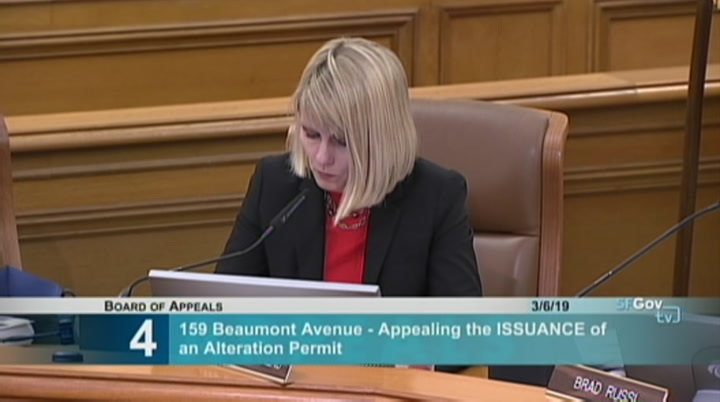 appellant's costs for copies and preparing the appeal. i'm here to answer any questions, and i brought my colleague along who has knowledge of the day-to-day operations of the project. 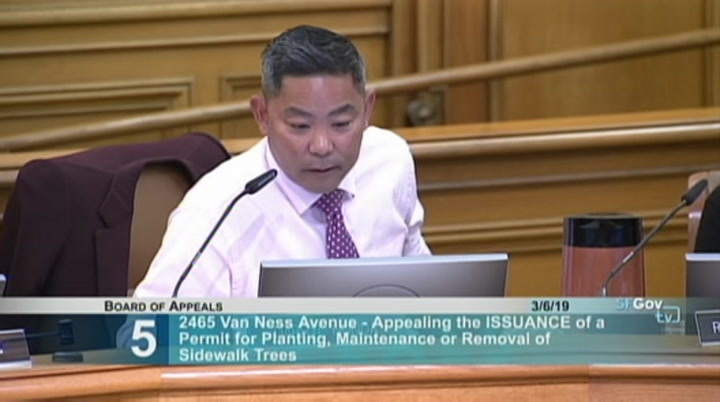 >> commissioner honda: i've got a couple questions. so were you noticed, were you aware that we had a hearing several weeks ago? >> no. >> commissioner honda: so it just didn't get to webcor's attention? >> yeah. if we were aware that the hearing was occurring, we would have been here. 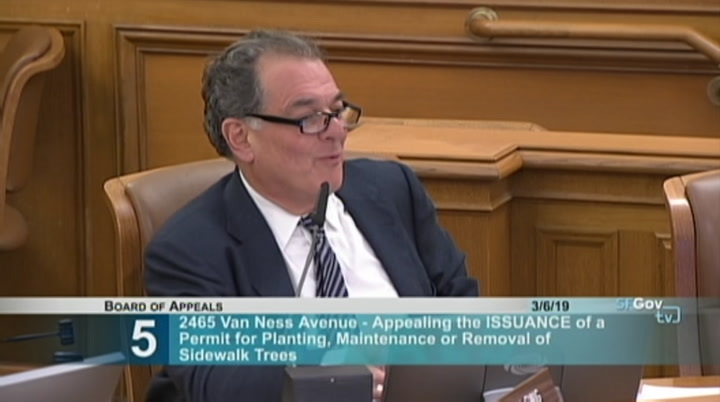 >> commissioner honda: maybe i can ask that director. were they noticed at that point? >> clerk: well yes, but i think the process was confus confusing. 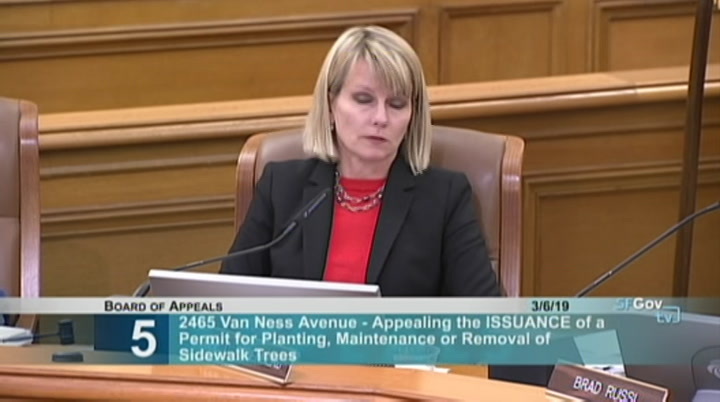 as you may recall, there was a process order for the jurisdiction request which granted the ability to remove the trees. mr. klipp filed a jurisdiction request, and subsequent to that, the bureau of urban forestry issued a permit for the tree removal. 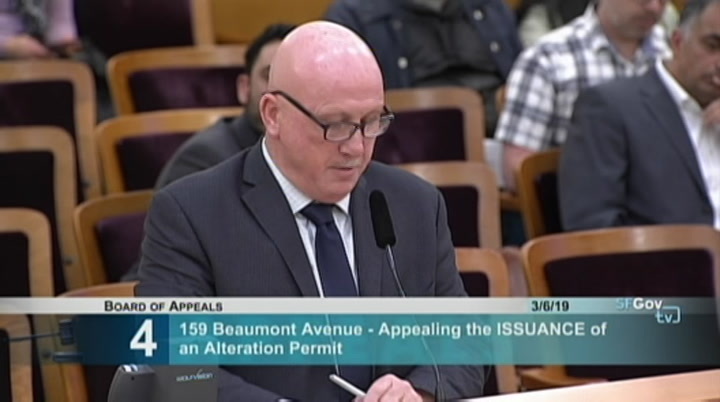 they've since changed their -- they're tightening up the processes, so that the order, the permit will be issued at the same time, so mr. klipp withdrew his jurisdiction request, and then, he appealed the permit, so he basically had two opportunities. he was late the first time, and i think when he withdrew his jurisdiction request, i believe, from what my discussions with webcor, they thought the matter was resolved. >> commissioner honda: okay. thank you. 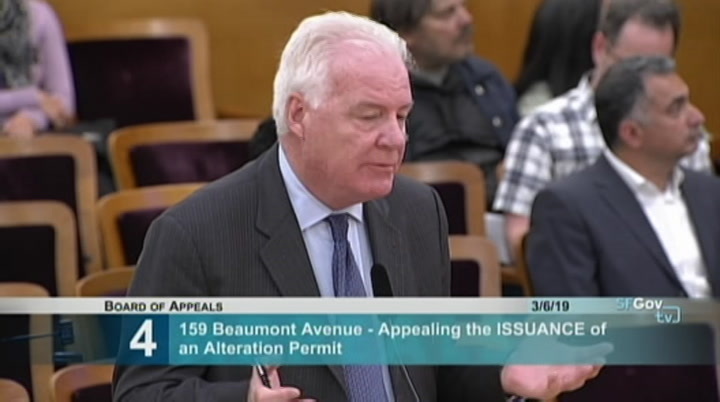 >> clerk: so i think there was confusion because of the process. 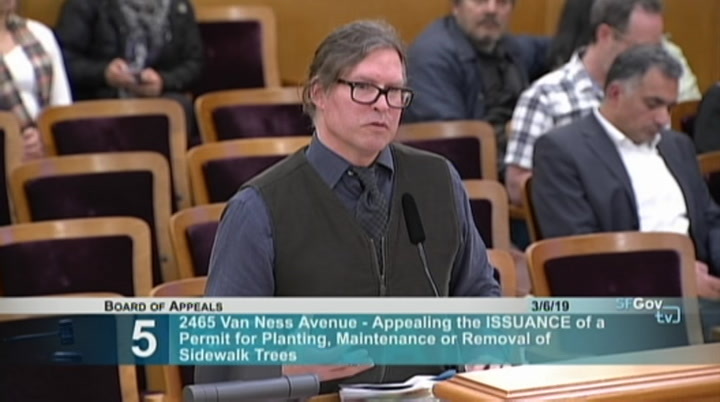 >> commissioner honda: and the second question, it was brought to our attention at the previous hearing that the permit went through a conditional use process and during that conditional use process, it was stated that those trees were to remain. 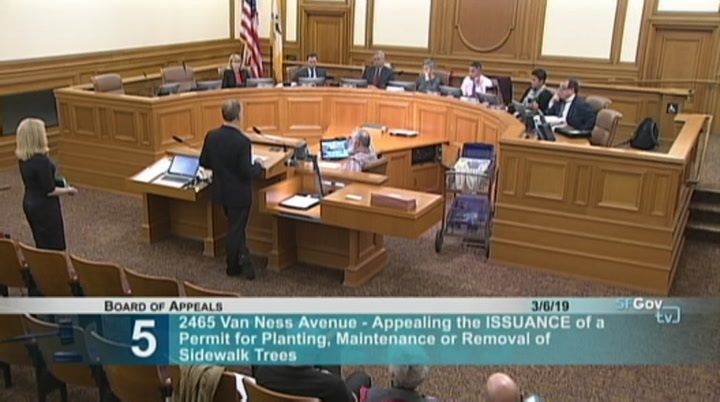 and so at which point -- who made the decision to go against the condition of use to take and remove the trees? trees. >> commissioner honda: no, i'm talking about the second time. 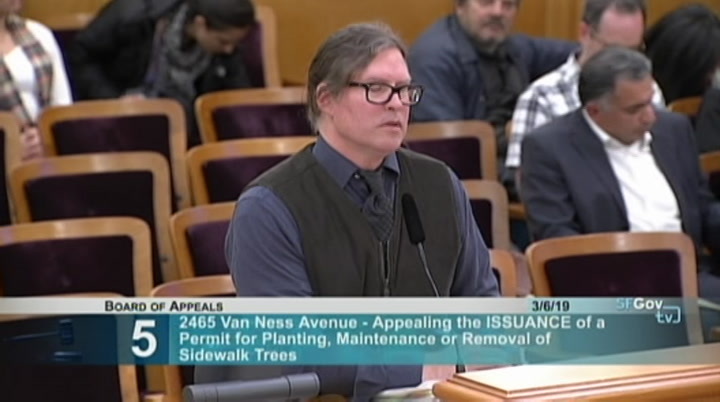 they applied the first time, it was denied. 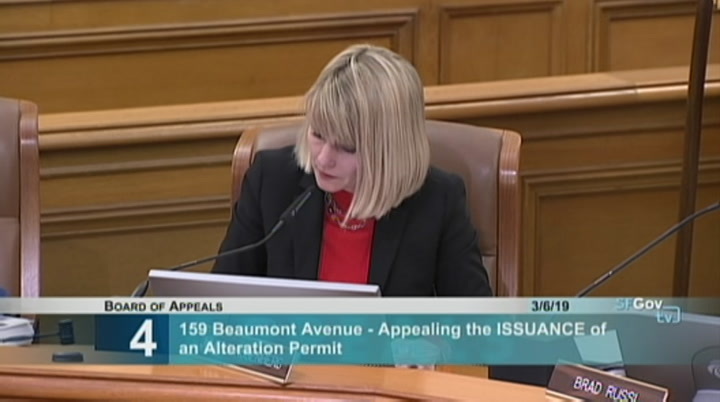 the second time, it was approved for removal, but there's a process that once that's done, the permit is still appealable correct? >> after the original denial, that's -- is that what you're talking about? >> commissioner honda: correct. 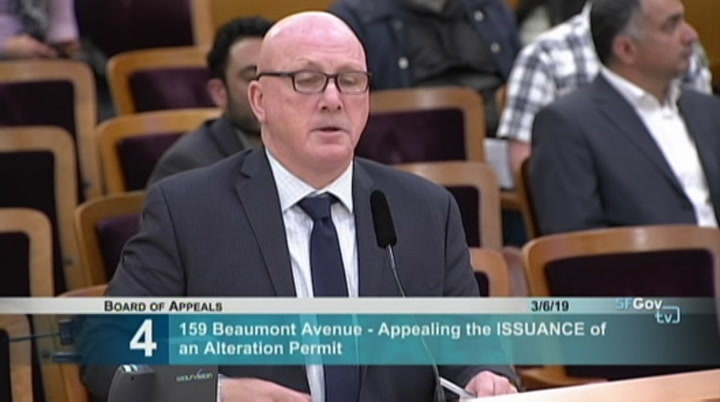 >> yes, i was not involved in that, but there was another permit to be issued and considered, so that again gets to the question regarding this case and the procedures and the process and what happened here? and something i think would be great for the board to look at. 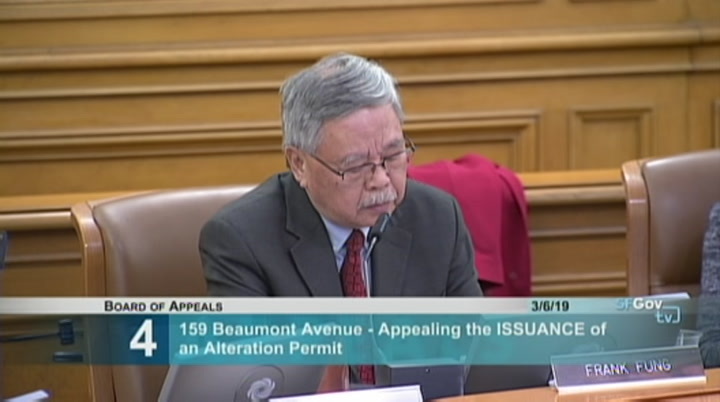 >> commissioner honda: yeah. and i think my question would be answered by one of the boards coming up further. >> yeah. to understand, we did not understand there was a time frame that we had to wait to remove it. i think if we would have known that, we would have obviously not gone in and done it immediately. on that. 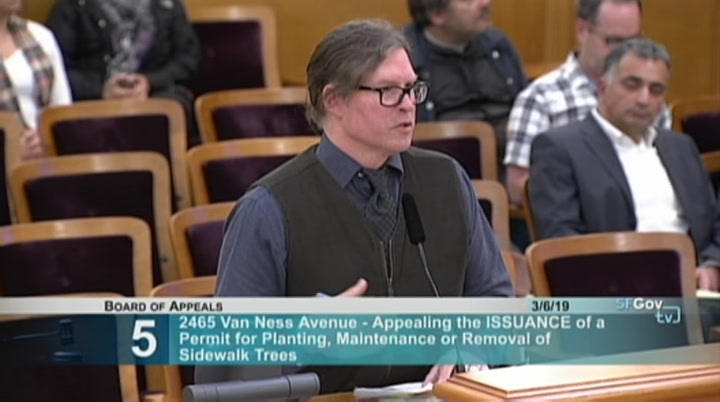 now that we have the applicant here, and we're rehashing the details, there's plenty of ground to cover. so this permit was not clean, the handoff was not clean in any way. 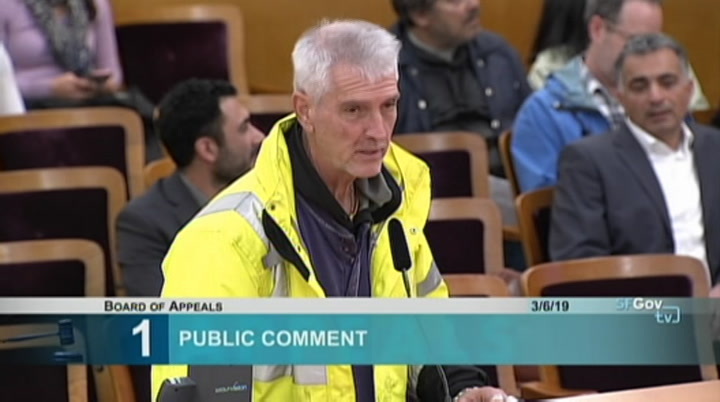 for decades, public works has hearings at public works. 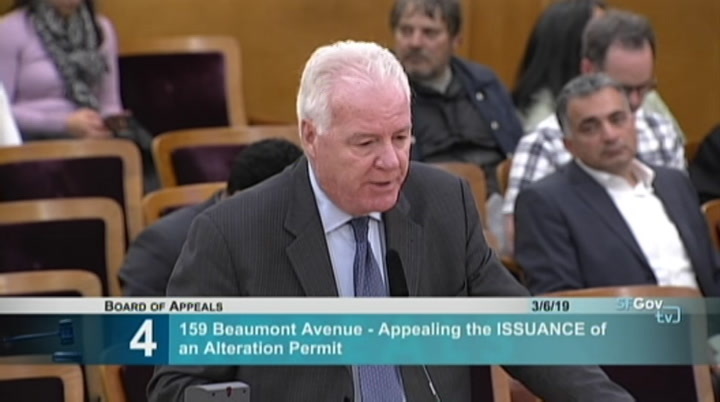 the subject of the hearing is the permit. 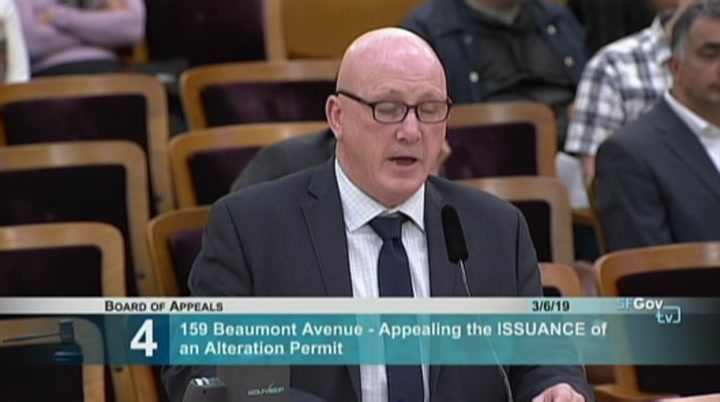 however, when we issue a resulting decision through habit or out of previous practice, we don't always reference the actual permit number. so what happened in this case is that there actually was a 15-day appeal window as we've done forever. 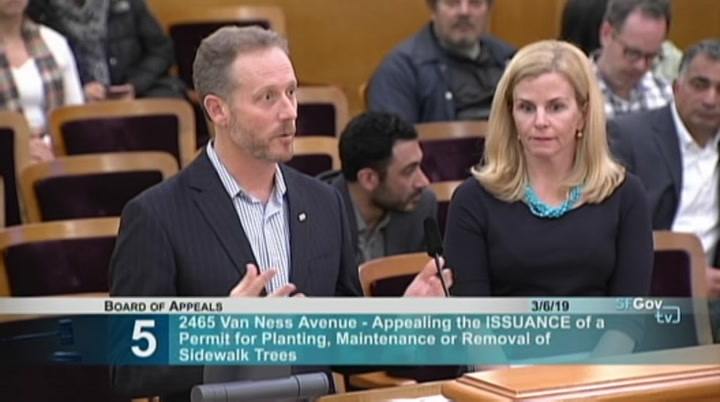 there was no appeal filed during that appeal window, and there was some miscommunication among both the department and mr. klipp on that. from now on, we'll always forward a resulting decision to anyone who's attended a hearing, regardless of whether they request a copy or not. address, the tree protection, we did address it on august 22, and it was installed two days later. 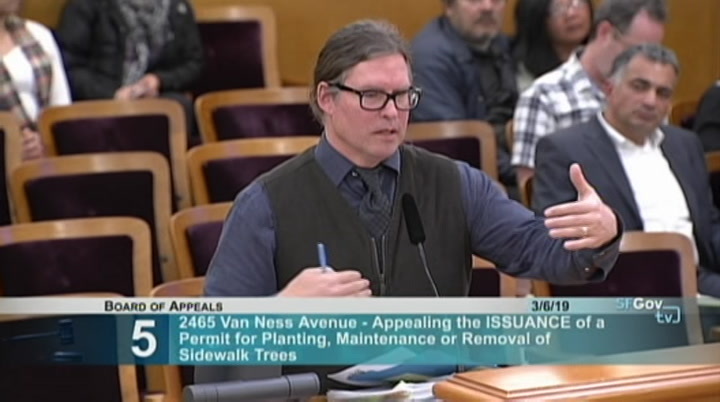 there were no, like, equipment out on the sidewalk, egregious. the trees weren't being damaged in any way. i would disagree a little bit with the applicant in that how they define construction. we could probably go back and forth on that, but any activities on-site, we consider to be construction-related activities, but again, we have someone that responded in 48 hours. 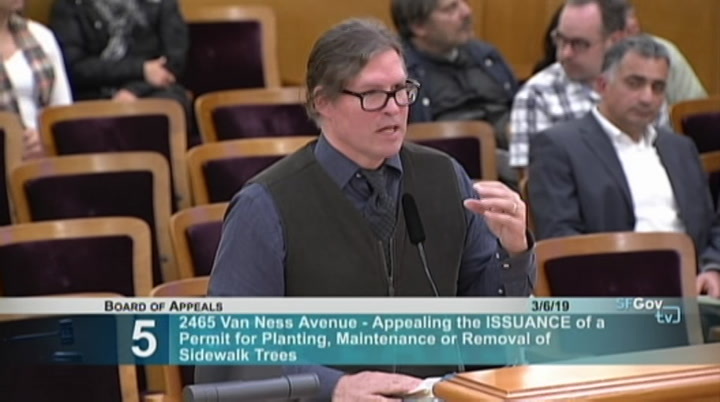 they didn't have a sloppy or housecleaning issues in the right-of-way, so i just want to address that. we're not shirking our responsibility. 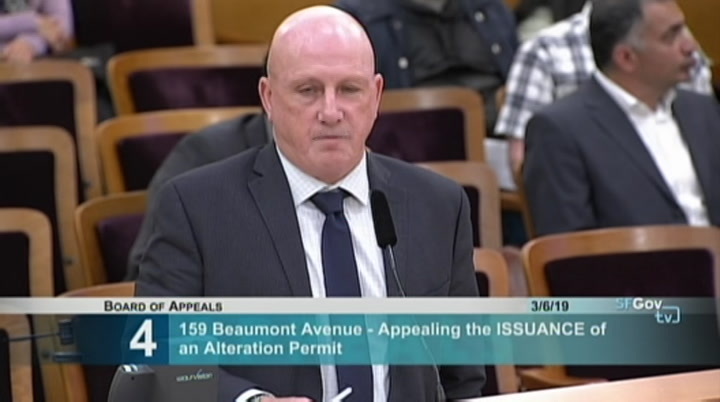 there's a lot of questions from mr. klipp about did they actually submit an appeal of our denial, and our inspector who's handled this case has been on leave with the national guard. three-foot-by three-foot box. those are the size differences. there is a nursery specification, like, the size of the caliper at the base of the trunk. they certainly don't come close to what was removed, but a right lane-inch box would be the most replacement size. 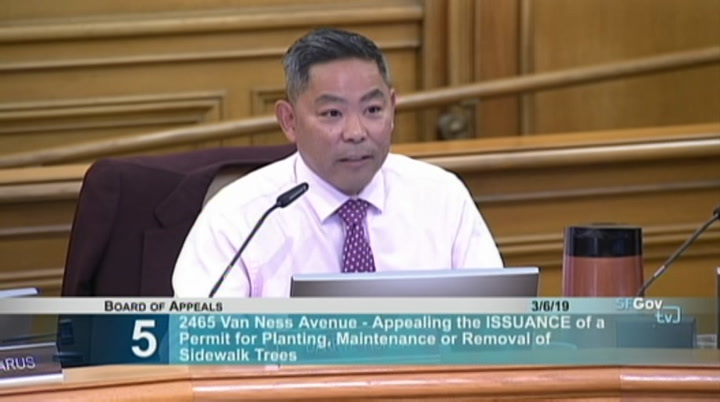 >> commissioner honda: you know, given the testimony before us this evening, hopefully, this is a one-off situation with this particular builder, but the process here just kind of reeks, as vice president swig said. 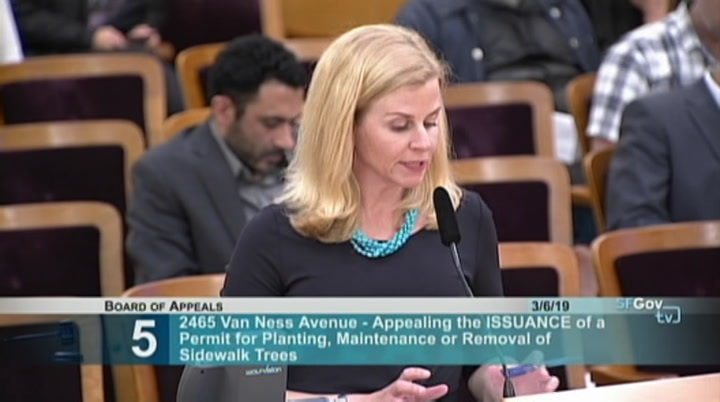 i mean, the concern here is could you walk me through that -- after the conditional use, they were required -- we went through this last time, but i'm getting holold. i'm hitting the speed limit.